An electromagnetic actuated clutch, sometimes called simply an electromagnetic (EM) clutch or an actuated clutch, operates electrically, but transmits torque mechanically. When powered on, the stator produces an electromagnetic field which engages the armature and rotor. The drive rotor then produces torque to the driven armature, which may have a sprocket or pulley mounted. 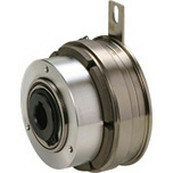 They are well-suited to remote control applications, as no mechanical linkages are required to control their operation. This gives them faster and smoother operation than standard mechanical clutches. 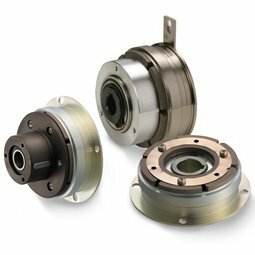 Miki Pulley’s electromagnetic actuated clutches provide accurate, reliable control for a variety of industrial motion control and power transmission applications. 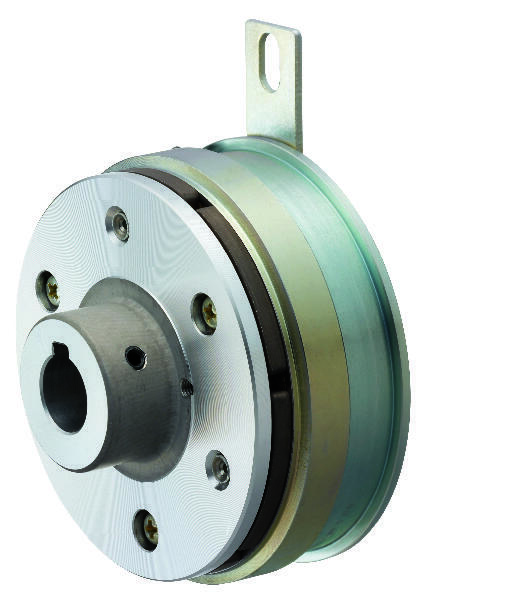 When installed between the driver and the load, our actuated clutches accurately connect and disengage power. With decades of experience, we have tested and refined our clutch designs to deliver unparalleled quality and reliability. We provide high quality, high performance actuated clutches to OEMs in numerous industries worldwide. Our electromagnetic actuated clutches have proven their value time and again, consistently meeting and surpassing customer requirements in terms of quality and service life. We offer actuated clutches in a wide range of sizes and configurations, with shaft or flange-mount options available. The 101 model electromagnetic actuated clutch is a durable and versatile solution, available with three different armature options. The 101 model clutch is built on a simple design, consisting of clutch stator, rotor, and armature assembly. The 101 is essentially the same as the CS model in operation and size range. The only difference is mounting style: the 101 is for shaft mounted applications, meaning that it will be mounted to a shaft with an anti-rotation bracket attached to the clutch body. The CS model electromagnetic actuated clutch is durable, versatile, and available with three different armature options. 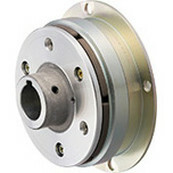 The simple design of the CS clutch consists of clutch stator, rotor, and armature assembly. It offers excellent torque transmission characteristics, with unmatched durability. The CS is essentially the same as the 101 model in operation and size range. The only difference is mounting style: the CS is for flange mounted applications, meaning that it will be fastened to a wall or bulkhead of a machine. Mounting the CSZ model actuated clutch is fast and easy, thanks to its one-piece integrated structure, designed around the CS-35 bearing. This drastically reduces time required to adjust the gap, and makes fine-tuning concentricity and run-out easy. Miki Pulley is the industry leader in high precision electromagnetic actuated clutches for demanding applications. Request a quote on the actuated clutch you need, or contact us for more information.